Polyscore version 7.0h is now available in our Software Updates area. V. 7.0h no longer requires authorization upon installation, but is limited to usage with Lafayette charts. V. 7.0a is still available for multiple chart formats, but still requires authorization. This software is not compatible with Windows Vista and older. Lafayette Instrument advises Vista users to upgrade to at least Windows 7 before the end of Microsoft Vista extended support in April 2017. 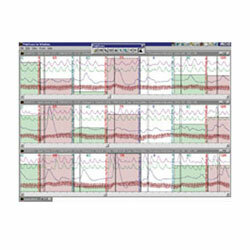 Polyscore Polygraph Software was created by the Applied Physics Laboratory at Johns Hopkins University. The latest version of Polyscore is now Windows based for ease of use. It allows you the ability to view and print stacked charts. Another feature that examiners will find valuable, is the on-screen color-coded bar graph display. This feature makes it very easy to graphically display reaction strengths, allowing for easy public / novice interpretation. Additionally, by upgrading to this version of Polyscore, current LX users will now be able to fully utilize all of its previously unavailable features. PolyScore v7.0h resolves the January 1, 2017 expiration notice error message. APL has removed compatibility with Windows Vista and older. Due to security and functionality concerns, Lafayette Instrument advises Vista users to upgrade to at least Windows 7 before the end of Microsoft Vista extended support in April 2017. A 16-bit error occurred while I was installing PolyScore, how do I fix the problem? I received an error message stating "this version of PolyScore has expired." What should I do? LX4000 Polygraph that includes a Polygraph DAS, LXSoftware, Pneumo Assemblies, Cardio Cuff, Pump Bulb, EDA Assembly, Activity Sensor, and all necessary cabling.